Liquid Concentrate / Makes 1 Gallon. Spray-on formula provides long-lasting protection for virtually any exterior wood surface including: wood decking, wood fences, plywood, wood shingles, wood siding and much more. Coverage	 100 to 300 sq ft.
• Ideal for use on wood decking, wood fence, gondolas/pergolas, plywood, wood siding, wood shingles and more. If excessive mold/mildew or dirt is present it is recommended to use EA-SafeClean prior to treatment. 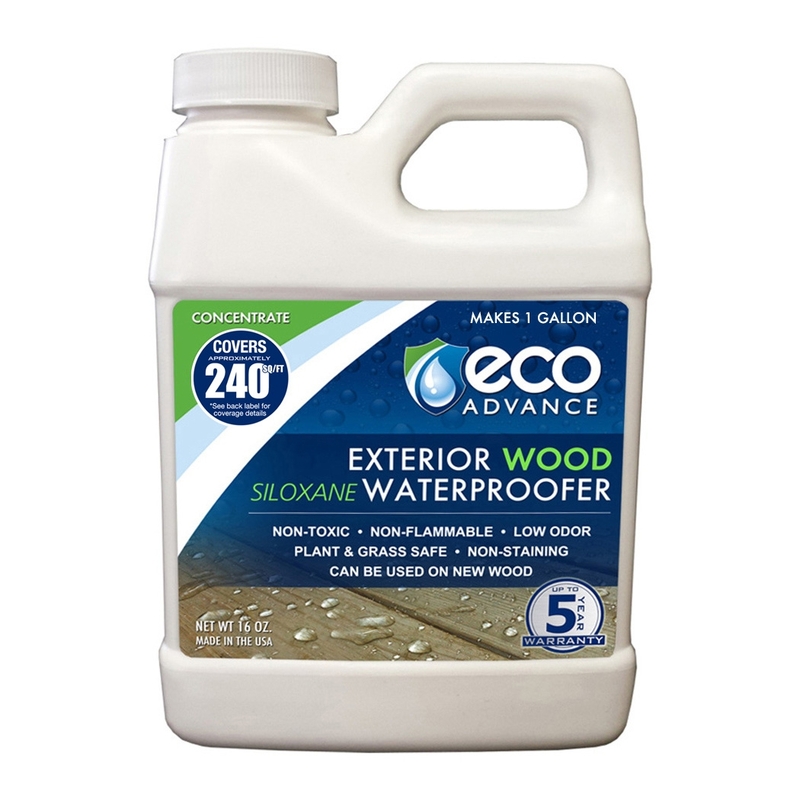 Before applying EA Siloxane all surfaces should be clean and free from dust, dirt, oils, grease, curing compounds, coatings, mildew, mold, algae, other water repellents or any other contaminants. If efflorescence (white residue) is present, wash surface with cleaner and/or pressurized water. Rinse any cleaning product thoroughly from the substrate. Surfaces may be cleaned by any agreeable method such as: Power wash, sweep, deck cleaners, stain removers / strippers. 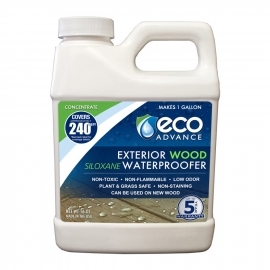 •Mix EA Siloxane Concentrate into one gallon container or sprayer with clean water. •Apply EA Siloxane using low pressure spray equipment. To avoid atomizing product, use a spray tip size of .035 to .051. •EA Siloxane can also be applied with a brush, roller, or mop but spraying is recommended. •Apply uniformly and avoid over application. Heavy runs and drips should be either brushed into the surface or removed with a rag or mop. On extremely porous substrates, two applications will provide superior application. •For interior applications it might be necessary to scrub floors after the product dries to remove any excess material from the surface that might cause slickness. •If needed, apply a second coat immediately after the first coat has penetrated. Control application so that the second coat is applied within a few minutes after the first coat appears dry. Eco Advancements, Inc. All rights reserved.